At Hindhu weddings, mandaps – basically small makeshift chapels with four columns (traditionally comprised of pots or pillars) decorated with flowers – are an essential part of the festivities as they are where several key rituals are performed. 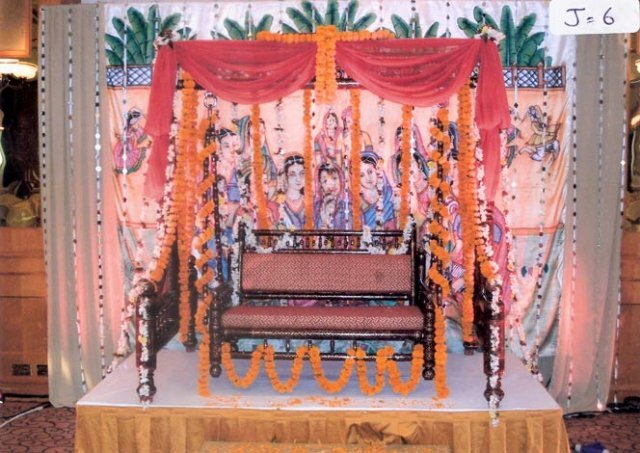 Needless to say, mandap decorations are a prerequisite for most Indian weddings. 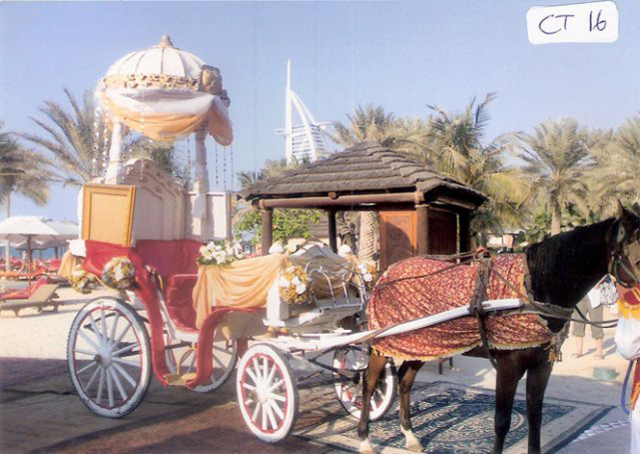 Well decorated mandaps add glamour to wedding celebrations. When elegantly decorated, these four-pillared structures can really set the mood for a wedding. 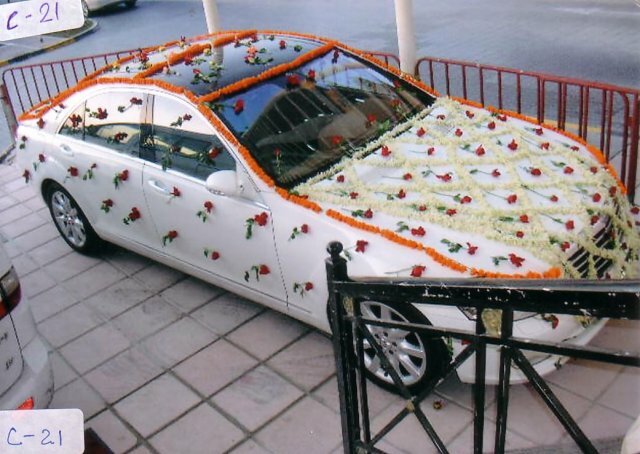 Wedding mandaps are decorated in red and silver – the colors of prosperity. The ritual of jaimala takes place at the wedding mandap. The groom and bride place garlands on each other at the mandap, which signifies acceptance. 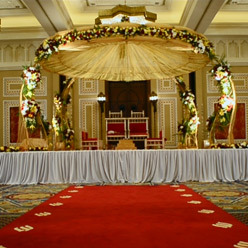 In contemporary times, mandaps often come in the form of four-pole canopies at the center of a stage, which are decorated in various styles. The sacred fire at the mandap symbolizes not only the illumination of the mind, but also knowledge and happiness; fire is also associated with cleansing and purity and it is in such a spirit that the flame bears witness to the ceremonies progressing in front of it. 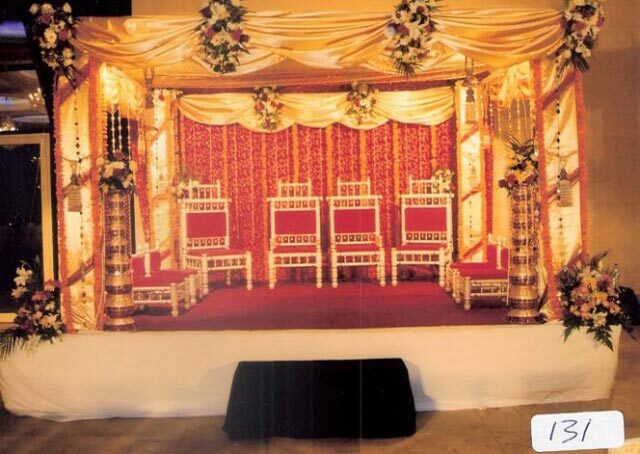 Mandap decorations are mostly theme-based and are typically based on rich, traditional colors like gold and red. 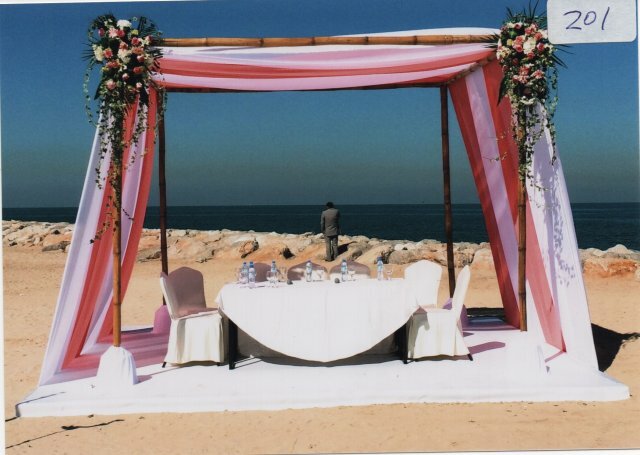 Decorative and attractive tents or Shamianas are rented to hold such ceremonies. These tents are bright in color and attractive enough to lure everyone. For lightning purposes, lanterns and candles are used. As per tradition, mandaps are decorated beautifully and ornately. Mandap decorations can also include beautiful flowers – both fresh and artificial – as well as wall hangings and artifacts. Champagne and Cake Reception: This is probably the least expensive type of wedding reception, and was once the norm for most weddings: everyone gathers after the ceremony for a bit of cake and a few toasts. However, don't ask your guests to drive home inebriated! Have your reception in the garden of your ceremony venue, or even in the same room. It's advisable to mention on wedding invitations that "champagne and cake will follow" so that guests know there will be no meal afterwards. Pros: It's cheap! If you're not a fan of big crowds or lots of mingling, a champagne and cake reception is often short and sweet. Cons: Guests often expect more! You might find that it's over far too fast for your liking and you'll have to skip out on some of the traditional aspects of a wedding reception. Cocktail receptions can be elegant and stylish, and allow guests to really mix and mingle with each other. They tend to be a bit more relaxed than traditional sit-down meals and often feel like a great party. Pros: If your venue is small, cocktail receptions allow you to have more people. They're typically shorter in duration than a traditional wedding dinner, and they allow you to really circulate and enjoy the party. Cons: While you might anticipate that a cocktail reception would be cheaper, your guests will likely drink more than at a dinner reception. Since most people won't be seated, some guests will have trouble viewing events like the first dance. The most classic, formal type of wedding reception is a sit-down or buffet dinner. It enables you to really celebrate your wedding, give your guests the 'velvet glove' treatment, and still have everyone on the dance floor afterwards! You'll start with a cocktail hour, then proceed into an adjoining room for dinner, followed by dancing, cake cutting, bouquet tossing and hopefully more. Pros: Your guests will feel special because you've gone all out. Moreover, you won't feel rushed or hurried. 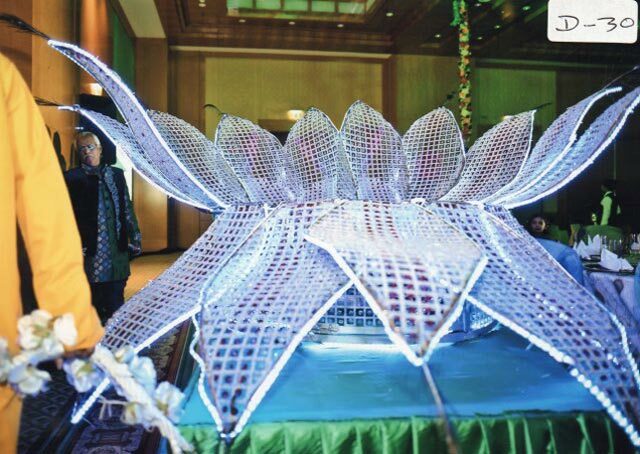 Cons: Generally, this is the most expensive kind of wedding reception you can hold. You might also feel a little sad that your wedding night in the hotel room is starts so late! A New Twist: After an hour or two of dancing, your guests might have worked up an appetite again. Serve a "surprise" treat at midnight of donuts, an early breakfast, or even fast food. 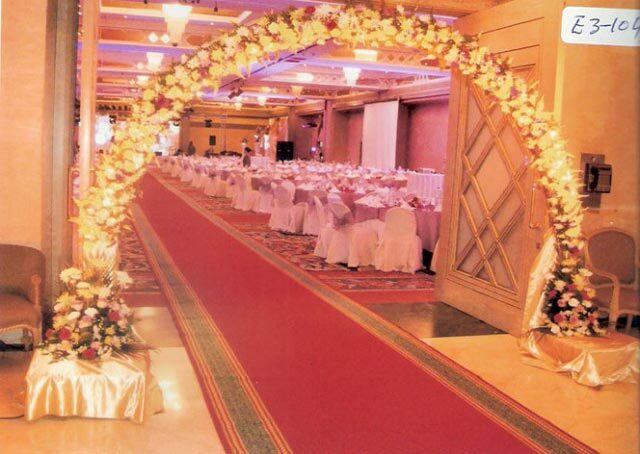 Wedding receptions are parties held after the completion of a marriage ceremony. They are held as a courtesy for wedding attendees, hence the name reception: the couple receives society, in the form of family and friends, for the first time as a married couple. Hosts provide their choice of food and drink, although wedding cakes are popular. Entertaining guests after a wedding ceremony is traditional in most societies and can last anywhere from half an hour to many hours – or even days in certain eastern cultures! Before receptions—a social event structured around a receiving line and usually held in the afternoon—became popular, weddings were more typically celebrated with wedding breakfasts (for those whose religious traditions encouraged morning weddings) and balls (for those who were married in the evening). The popularity of receptions over breakfasts, dinners and balls during the 20th century led to the label reception being applied to any social event after a wedding, be it brunch, tea, dinner or a dance.